Safeguards have an economic origin. When the World Trade Organization (WTO) was created in 1995, there was already debate about trade safeguards. The idea was to protect or look after national interests when problems arose related to international trade. However, they generated countless controversies and ultimately all safeguards were declared illegal. This shows that when the interests of trade conflict with any other interests, trade interests always win. Given this history, nothing better could be expected in the case of REDD+ safeguards. The Inter-American Development Bank (IDB) and the World Bank (WB) have also established their own safeguards and social and environmental standards for the projects they fund. However, we know that instead of protecting communities and nature, what they seek is to protect their projects or “the natural resource assets implicated in the execution of a project.” (1) The World Bank is currently revising its safeguards and standards policies downwards, as it is seeking even greater flexibilisation of environmental and social “requirements” for its projects. The consequences are serious, as the World Bank influences and guides social and environmental policy standards for many public and private, national and international entities. It is no coincidence that this review is taking place now. It is framed within the context of the new international scenario defined by the application of the REDD+ mechanism. The seven REDD+ safeguards approved at the 2010 United Nations climate negotiations (2) are: complementarity and consistency with national forestry systems and natural forest conservation, transparent and effective governance, full stakeholder participation, respect for the knowledge and rights of native peoples, and two other “safeguards” of a clearly commercial nature to do with reversals and emissions displacement. As in every similar process, the United Nations REDD+ program (UN-REDD) has set up phony participation processes for national endorsement of the safeguards, carrying out consultations with different stakeholders to arrive at a “consensus” on the safeguards to be instituted to ensure the success of REDD+. (4) Moreover, in addition to the safeguards there is a series of “guidelines,” “principles” “participation systems,” “fair value assignment,” and other tools. Behind the jargon they hide purely commercial interests. Indigenous peoples obviously had to be included in these safeguards since they are the owners of most of the world’s remaining natural forests. Women, too, were quickly incorporated as stakeholders in REDD+ national programs, a decision that was part of social pacification policies in the face of increasing conflict and rejection – above all by women in local communities – of projects and public policies of an extractivist nature, and others. So in order to sugar the pill of these developments, indigenous people and women were integrated as “stakeholders” in all investment projects, including REDD+. The UN-REDD process has incorporated the concept of gender equality to make “REDD+ more efficient, effective and sustainable.” (5) This approach has already attracted criticism of various kinds. For instance, the Global Alliance of Indigenous Peoples and Local Communities on Climate Change against REDD+ and for Life has said: “It is clear that REDD+ also constitutes a new form of violence against women because it limits or prohibits women’s access to the land where we farm, gather food and draw water (for) our families.” (6) Women are responsible for 90 percent of these activities in rural communities worldwide. Moreover, women own less, inherit less, and in general have less access to community goods than men. It should also be noted that under the mechanisms of payment for environmental services – like the carbon credits marketed through REDD+ – it is generally the men of the communities who receive the benefits, since the agreements are signed with associations or organizations’ councils, made up mostly of men. And when women are the recipients of payments, usually incentives for planting forestry plantations, it may lead to increased domestic violence, with men wanting to control the money. Worse still, women are tasked with preventing forest clearance (7) although they are not responsible for the problem. In this way, women have been recruited to the global pool of cheap labour that watches over the merchandise (carbon, water, biodiversity, or any defined environmental service) from which capital derives profits. They are obliged to travel for hours to receive the payments; they must not only act as rangers in their own forests, but police officers in their own communities. They have become exploited workers (8) toiling for a pittance. We are experiencing a global economic crisis due to overproduction and overaccumulation which has led to poverty, debt, unemployment and so on; and an environmental crisis with serious effects, such as climate change, deforestation, loss of biodiversity, pollution, etcetera. In such a context, inequalities are always exacerbated, affecting mainly women and indigenous peoples. This is a foregone conclusion, since under capitalism and its crises, the weakest are obviously the most vulnerable. Women are exposed to a double risk: they face capitalist exploitation, and on top of that, the oppression of the crises it generates. According to feminist author Silvia Federici, (9) the United Nations has effectively redefined the feminist agenda. The inclusion of the gender perspective in instruments like REDD+ is an example of this. But in practice it might turn out to be a trap. According to Federici, when women receive payment for their work, they are not really gaining autonomy or liberation. This is not to say there should not be differential subsidies for women; however, the capitalist system undervalues the work of caring, and women care for their families, their farm plots and the forest. Therefore capitalism devalues the lives of women in order to continue devaluing workers. 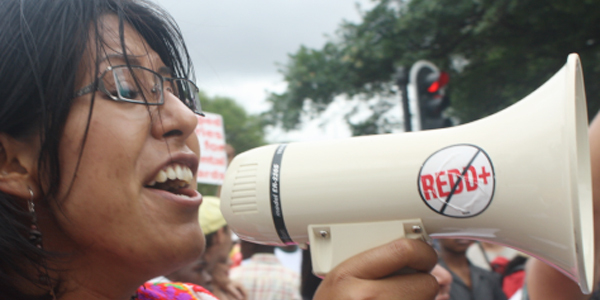 By means of REDD+, capitalism is extracting the labour of millions of indigenous women. This signifies a commodification of women’s emotions and particular needs. That is why no “safeguard” can liberate women. This thesis is fundamental to an understanding of why we must oppose the marketing of environmental services. A woman, or a community, given a payment for looking after the forest under REDD+ is indirectly allowing capitalism to reproduce and be strengthened through the exploitation of workers who produce goods, extract oil, work in mines, etcetera. By making these payments, States, banks and companies buy the right to continue to overproduce and overaccumulate by means of the exploitation of workers and nature. This is a fundamental issue that is not being taken into account in the debate on REDD+, but is key in the agenda of the defence of women’s rights and debates on climate change, forests and environmental services.